Canadian wheelchair athlete Josh Cassidy completed the 2012 Boston Marathon in a staggering time of one hour, 18 minutes and 25 seconds, shaving two seconds off a world record that had stood for eight years. But he was devastated after failing to win a medal at the London 2012 Paralympics and in 2013 made the headlines for the wrong reasons at the London Marathon, when he was involved in a collision with women's favourite Tiki Gelana. 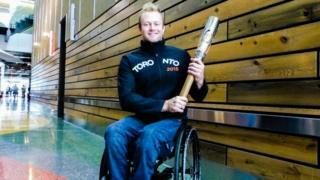 I caught up with Josh as the Queen's Baton toured Toronto, curious about a statement on his website: "Paralympic or Olympic? Call it what you want. I'm an athlete." I was interested to know why he felt it so important to say this. "In the UK things are good now. Unfortunately everywhere else, Canada included, coverage isn't the same. People don't know what's going on with Paralympic sports. On one hand you get the same respect as an Olympian, but on the other, no one can really identify or associate with it, as they don't see it." 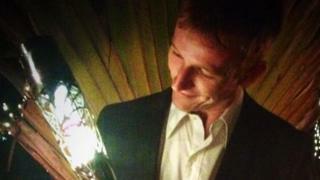 In 2013, 33-year-old Kent Gabourel was crowned winner of the Lionman, the biggest triathlon in Belize, and qualified for a place at Glasgow 2014. His home, Ambergris Caye, is a small island 90 minutes by boat from Belize City. At the age of 15, Joe Chapman from British Virgin Islands was the youngest ever squash player to compete at the Commonwealth Games..
Now 23, he has turned professional and is training hard for his third Games in Glasgow this summer. In the world of athletics, all eyes are on 18-year-old Zharnel Hughes. A few weeks ago, he ran 10.12 seconds in the 100m of the prestigious Jamaican Inter-Secondary Schools Boys and Girls Athletics Championships - beating a record held by sprinting superstar Yohan Blake. 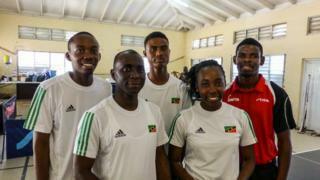 Eighteen-year-old Angelisa Freeman and her 19-year-old brother Andre are preparing for the competition of their lives at Glasgow 2014, as they form part of the first ever table tennis team from Saint Kitts and Nevis. In a part of the world where most young people grow up dreaming of becoming sprinters or cricketers, the pair are inspiring a new generation of players. 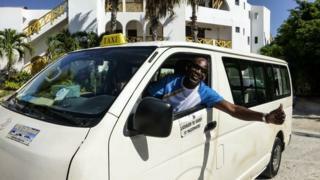 I have had the chance to meet some colourful characters on the amazing journey of the Queen's Baton Relay so far, and Hilson Joseph is one of the most memorable yet. 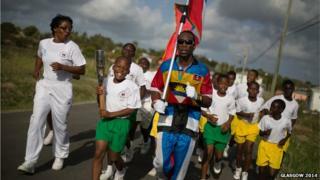 Starting at 6.30am, Hilson - known throughout his country as 'Flag Man' - completed 12 hours of the relay in Antigua, through the streets of the capital St. John and across the island. 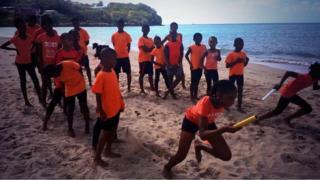 "I want to become the world's fastest man," comments 11-year-old Miguel Charlery, a member of the Rockets Athletics Club in Saint Lucia. "I would like to make it to the Commonwealth Games and impress everyone. And I would hope to go the Commonwealth Youth Games! It will be great to have a big championship in my own country." 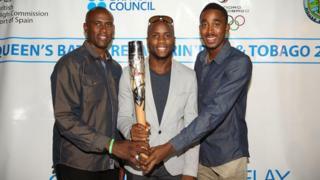 Image caption Emmanuel Callender (centre), Roger Daniel (left) and Jehue Gordon (right) hold the Queen's baton. Emmanuel Callender and Jehue Gordon are among the superstars of Trinidad and Tobago athletics and hold a fistful of Olympic and World Championship medals. As the Commonwealth Games approach the pair are focused on returning to the podium for more success. Gordon is the current 400m hurdles world champion following his victory in Moscow last year. Callender is a two-time Olympian securing both silver and bronze in the Men's 4 x 100 m relay. 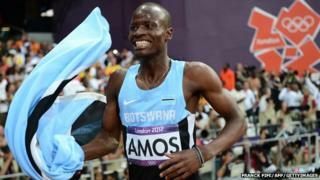 At London 2012, 18-year-old Nijel Amos won a silver medal in the 800m and became the fourth fastest man ever over the distance. Not bad for someone who just six months earlier was coached by his geography teacher on a high school dirt track in his native Botswana. I met Nijel soon after I touched down in Botswana, he talked excitedly as he drove me to the local stadium for a training session. Kipchoge 'Kip' Keino is a legend in eastern Africa and it is not hard to see why. 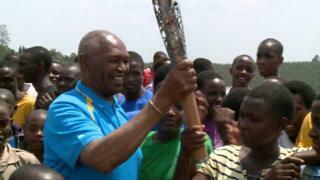 The 1500m champion enjoyed a hero's welcome whilst leading the Queen's baton delegation through Kenya, Uganda, Rwanda and Tanzania. See the route of the Queen's Baton Relay. BBC Sport's guide to the 2014 Commonwealth Games in Glasgow.